Projections of pension spending are crucial in the analysis of the long term sustainability of public finances and, in particular, of the debt to GDP ratio. This Focus compares three projection exercises on the pension expenditure to GDP ratio in Italy, disseminated in the second half of 2017 and the first months of 2018. Based on demographic and economic hypotheses that in some cases are markedly different, these projections exercises show significant differences in pensions spending to GDP dynamics. The first forecast exercise considered (national exercise) was developed by the State General Accounting Office (RGS) as part of the annual updates of medium-long term projections of public spending connected with population ageing (pensions, health services, long term care, education and unemployment benefits). The second is the AWG exercise which, on the basis of the same analytic instrument employed by the RGS, utilises the hypotheses agreed upon within the Economic Policy Committee Working Group on Ageing Populations and Sustainability. This exercise is valid for the purpose of the European Commission’s analysis of the sustainability of public finances in the framework of multilateral surveillance. It is also the basis that each country considers for fixing the minimum value of the medium term objective sufficient to ensure the convergence of the debt to GDP ratio towards prudent levels, taking into account the economic and budget effects connected with population ageing. The third projection is the one recently published by the International Monetary Fund (IMF) in the context of a broader analysis of Italian public finances (IMF exercise). This last projection does not however derive from the utilisation of an ad hoc pension system model but rather from the application of a further grouping of hypotheses on the RGS results (chiefly through sensitivity analyses). 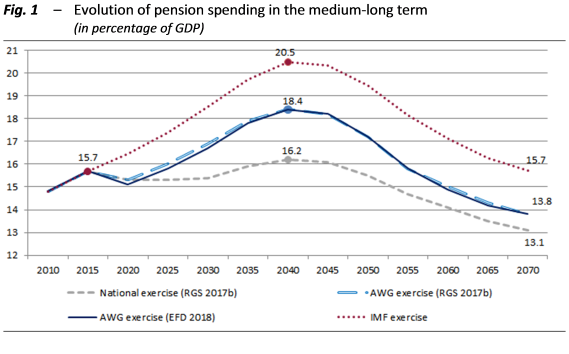 All the projection exercises show common characteristics for pension expenditure to GDP ratio in the medium and long term: the ratio first undergoes a growth phase, which culminates around 2040, and then a phase of decline (Fig. 1). Different however, and also markedly so, are the peak values and those reached at the end of the projection horizon. For the national exercise the ratio, after a slight reduction, would reach a peak of 16.2 percent in 2040, then drop progressively to 13.1 percent in 2070. In the first years the AWG exercise gives results not very dissimilar to the national one; subsequently, however, the ratio shows a more marked dynamic which leads to a peak of 18.4 percent of GDP in 2040, after which it drops continuously to 13.8 percent in 2070. Lastly, the IMF exercise is distinguished by projections of increasingly greater pension spending to GDP ratio throughout the horizon under examination. The ratio reaches 20.5 percent in 2040 and subsequently drops to less than 16 percent in 2070. The three projection exercises adopt the same analytic instruments and the same pension system legal framework. On the contrary, the underlying demographic and economic hypotheses diverge, sometimes even markedly. In the short term the difference in hypotheses influences mainly the dynamics of the denominator, i.e. the GDP, while in the medium and long term it is also reflected in different projections of the number of new pensioners and the average level of pensions paid. 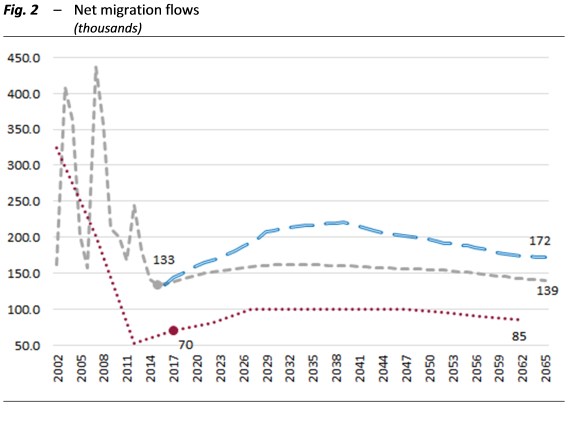 As for the demographic hypotheses, in all three exercises we observe a rapid ageing of the Italian population (the old-age dependency ratio would rise from the current 33.7 percent to more than 60 percent in 2070), mitigated only in part by migration flows. But it is precisely in the estimate of this last variable that we find the greatest demographic differences among the three projections (Fig. 2). The AWG projections for 2065 in fact forecast an average annual migration flow of around 170 thousand units, against an IMF projection of 85 thousand. 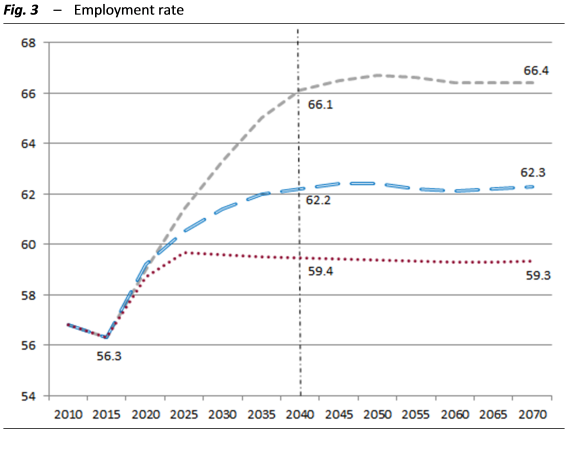 The economic hypotheses differ mainly with regard to the employment rate (Fig. 3) and the dynamics of productivity (Fig. 4). 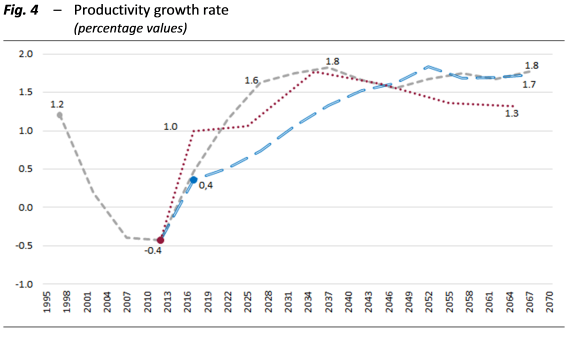 In this case the most optimistic hypotheses are those in the national exercise which see the employment rate exceeding 66 percent from 2040 onwards and the productivity growth rate remaining above 1.5 percent after 2025. The most pessimistic are those of the IMF, according to which the employment rate remains fixedly beneath 60 percent and the growth of productivity stabilises in the long term at 1.3 percent. Higher values for the pension expenditure to GDP ratio in the AWG and IMF exercises do not therefore derive from reflections of past pension system reforms – which on the contrary aimed at improving sustainability – but rather from a longer persistence of the effects of the macroeconomic crisis in terms of low productivity and a worsening of the demographic picture, traceable to lower net migration flows.